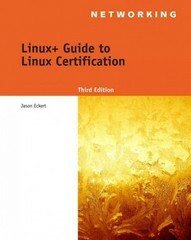 Linux+ Guide to Linux Certification 3 Edition LINUX+ GUIDE TO LINUX CERTIFICATION, THIRD EDITION offers the most up-to-date information to empower users to successfully pass CompTIA's Linux+ (Powered by LPI) Certification exam, while maintaining a focus on quality, classroom usability, and real-world experience. This complete guide provides not only the conceptual knowledge, but also the hands-on skills necessary to work with the Linux operation systems in a network administration environment. Comprehensive coverage includes updated information pertinent to the latest Linux distributions, as well as new storage technologies such as LVM and ext4. Readers will learn about new and expanded material on key job-related networking services including FTP, NFS, Samba, Apache, DNS, DHCP, NTP, RADIUS, LDAP, Squid, Sendmail, Postfix, X, SSH, VNC, SQL, and updated information on security practices and technologies. The Hands-On Projects help learners practice new skills, and review questions and key terms reinforce important concepts.